Bison weigh up to a ton. They are over twelve feet long, and are quite the beast. Despite their massive size, the bison can really run. They are often clocked at up to 35 mph. Bison once roamed in very large numbers, but they were hunted to near extinction. Now the bison has escaped that danger, but there are nowhere near as many bison now as before. 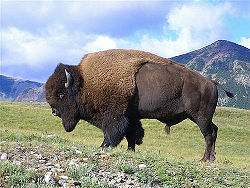 The bison were mainly hunted for their meat, and their very thick fur that could keep the natives warm in the winter. A bison and bison calf. The reproduction in bison is a pretty slow process. This contributed to a large part of why the bison population dropped so quickly, and is still quite low. Bison may mate anywhere between June and September, with the majority of it happening in July or August. After mating, it takes up to 185 days for the single calf to be born. This usually takes place somewhere in April or May. Also, the crossbreeding of bison with cattle, is highly discouraged, as it weakens the bison's genes. However, this still happens and today there are very few wild bison with complete bison genes. Pile of bison skulls waiting to be ground into fertilizer. Just a very small percentage of all the millions of bison slaughtered. BISON Jim Peaco, Defenders of Wild Life, 2008. Bison ERIUS GEIST, "The Canadian Encyclopedia", 2008, (). The Difference Between Buffalo & Bison "thenibble", Lifestyle Direct,, 2005-2008. This page was last modified on 5 December 2014, at 17:24.